BBM isn't just on BlackBerry phones any more. BlackBerry might have fallen on hard times but BBM is one area of its business which is still going strong and the launch of BBM on Android and iOS is likely to strengthen it further still. The messaging app is available to download now and has already proved tremendously popular, with over 5 million users downloading the app in the first eight hours that it was on sale, according to a tweet sent from the BBM Twitter account. BBM was originally meant to launch a month ago, but an unofficial version of the Android app was posted online and downloaded 1.1 million times, causing BlackBerry issues which halted the official launch. A successful BBM launch is exactly what BlackBerry needs after months of financial issues. However the downside to BBM's popularity is that BlackBerry has had to roll it out gradually to users. You can download it now but once you do you'll be prompted to enter your email address to join a queue, at which point you'll then have to wait till BlackBerry contacts you and gives you access to the app. If you signed up for notifications at BBM.com in advance of the launch then you should be able to use the app immediately, but everyone else will have to wait. 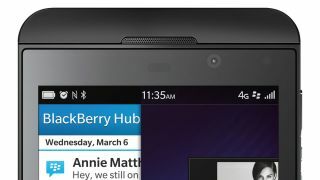 It remains to be seen how many users will ultimately sign up for the app and how ongoing its popularity will be, but the popularity of it at launch suggests there might be a hint of sun breaking through BlackBerry's clouds. On Windows Phone and looking for some BBM love? You might be in luck.